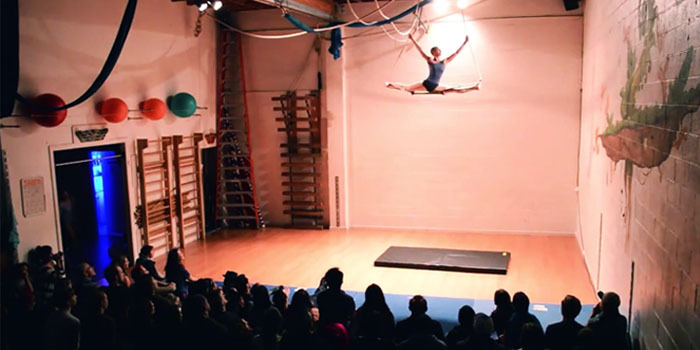 eventseeker ran away to the circus – Emeryville’s Athletic Playground – for a night of dazzling aerial silks, trapeze and acroyoga performances. Some quality clowning – hosted by Sal Monella, the night’s MC – kept things lively between gorgeous routines performed by both the students and teachers at this eclectic circus gym. Big thanks to Shira Yaziv and all the talented performers and volunteers from Playground After Dark for showing us how great circus can be outside of the big top. We keep a close eye on all types of events. If you think you found a missing puzzle piece or know an artist that would like to be featured – go ahead, drop us a tip.